Hallie GHJ was born on May 19, 2010. This tall, modern filly is the result of an elusive AHR GOLD x GOLD cross. Hallie’s sire, Alfa of Genesis, is a 3-time AHR ‘National Champion Stallion’. Alfa is one of only two AHR GOLD classified stallions in North America (the other being Aristocrat TOF) and he is the highest AHR GOLD classified stallion ever with a record-setting 82 points to his credit at his inspection in 2008. Alfa’s sire, Allacher, stands in Holland and he is the premier breeding stallion in that country. He has been Dutch National Champion along with being a Dutch Selection Champion. His offspring dominate the shows and selections throughout Holland. Alfa’s dam, Eva van Leivere, is a great producing mare in Holland that is sired by the great moving stallion, Atlantic. Atlantic was also a Dutch Selection Champion. Hallie’s dam, Heike TOF, was imported from Austria. Heike is a 60” AHR GOLD classified mare. 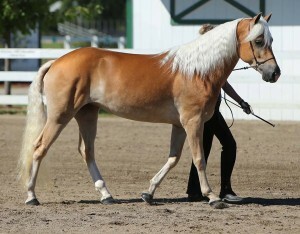 Heike herself has been a 2-time AHR ‘National Champion Mare’. She is sired by the proven broodmare-producing stallion, Andrit. Andrit passes on long necks and exceptional movement to his offspring and Heike is no exception to this. Heike has already produced many successful offspring, including Heaven Sent TOF, another former AHR ‘National Champion Mare’ and an AHR approved stallion for breeding, Next Level GHJ, along with many other futurity champions and AHR silver classified offspring. 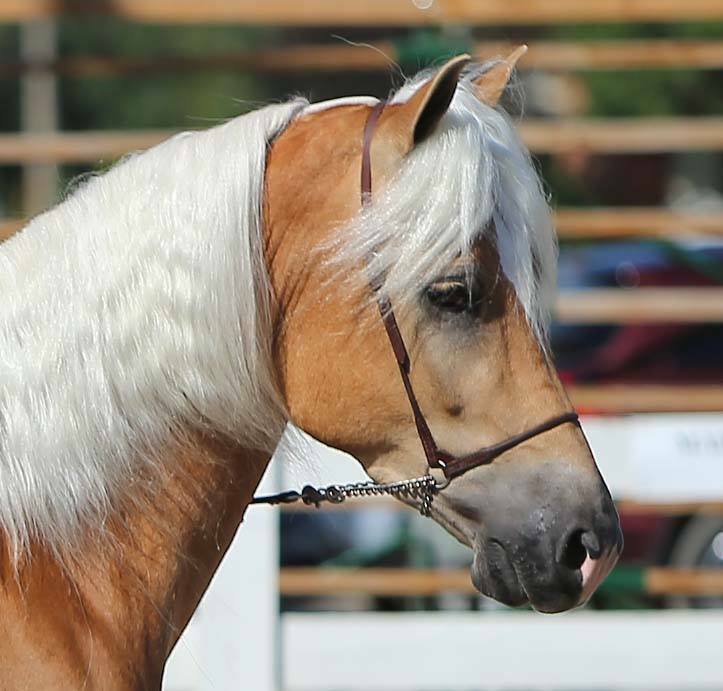 Hallie epitomizes the sport horse type haflinger with great athleticism and super movement. Unfortunately for Hallie, she is the same age as our notorious barn superstar, Aura of Genesis, so she has always been in Aura’s shadow. It never made any sense for us to haul more than one filly in the same age division to the shows, so Hallie has always been a pasture horse while Aura has been a staple in the Genesis Farm show string. In 2013, Hallie attended her official AHR Inspection and Classification and received 79 points. This meant that Hallie became high-silver classified and tied for being the highest scoring mare of the day. This affectionate filly is willing and personable. We look forward to seeing what the future holds for this AHR GOLD x GOLD filly that is now high-silver classified herself! We feel that her future potential is unlimited!